I love the Canucks. Yes, even though they have given me my fair share of disappointments over the years, my support for them is unwavering. I do go to the occasional game here and there; but due to my busy schedule (and the freakin' expensive ticket prices), I haven't been to many games lately. Hey, the stadium was still GM Place the last time I watched a game. In fact, it was courtesy of Rich Guy. He had invited me to watch a game in his brother's private suite. Now you can see why his brother has the nickname of Richer Guy! Last week, Rich Guy had invited me again to a game; but I was unable to go. Fortunately for me, he asked me to go again and I jumped at the chance. Apparently, Costanza and Toolman jumped at the chance too. Ah, nothing like watching a Canucks game from a suite. The private washroom is worth it alone! However, who really orders stuff from the menu? $80.00 for a prime rib sandwich??? Uh, no thank you very much. I can get a whole prime rib at that price. Consequently, we left our eating until after the game. 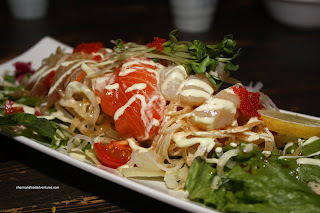 Since we were in Downtown, we headed over to Guu with Otokamae in Gastown. Wait, aren't there closer locations to Rogers Arena? Yup, but I've been to every Guu in the GVRD except the one in Gastown. Now it is complete... Since we didn't have an actual dinner, we were quite hungry. So we ended up ordering 15 dishes. Our server was giving us the funny face when I got to about the 11th dish while ordering. I guess he assumed we were here for a snack. Well, Izakayas are not technically meant for dinner since it is supposed to be an after work drinking establishment with some small bites. We started with the Sashimi Salad and it looked big due to the large amount of spring mix and daikon underneath the fresh slices of salmon, tai and scallop. The garlic dressing with wasabi mayo added nice flavour to all of the components without being overwhelming - a nice start to the meal. From healthy to no-so-healthy were the Japanese Yam Fries with honey mayo. 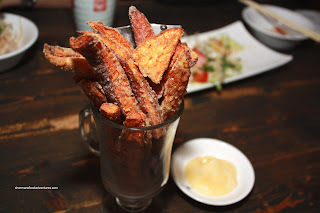 Unlike the common yam fries we are accustomed to, these ones were appreciably thicker and less crunchy. The outside was still somewhat crispy while the inside was noticeably smooth yam. Thus, there was a nice textural contrast within each fry. The honey mayo was nice; but personally, I would've like to see a dip with some zing (with some balsamic or acid). Rich Guy loves Beef Tataki, so it was natural we order it. In fact, he merely looked at me and I already knew. It's like ESP or something. Maybe he's just predictable, much like his aversion to cheap food... This was a textbook version of the dish with lightly seared beef served in thin slices topped with ponzu, garlic chips and green onion. I like this combination of flavours the best, unlike some other less authentic Izakayas that employ a vinaigrette of some sort. The only negative in this case was the slightly chewy beef. When I spotted Eel & Egg on the fresh sheet, I thought we should give it a shot. 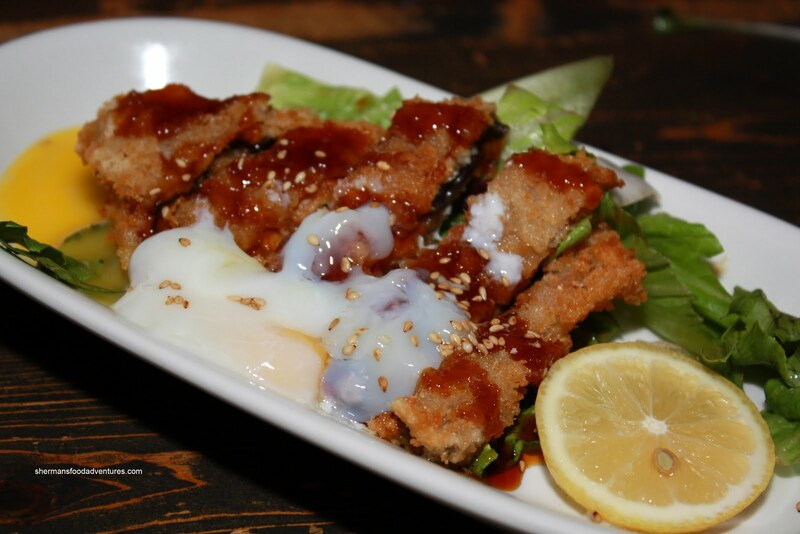 It's basically a breaded piece of eel topped with a half-boiled egg and teriyaki sauce. Texturally, this worked because the soft egg was a nice contrast to the crunchy eel cutlet. However, I personally wasn't all that convinced of the flavour. Let me rephrase that, the lack of flavour. Since the eel was fried, it got lost in the breading. The egg had no inherent flavour of its own and the modest amount of teriyaki sauce didn't have much impact. Meh. Okay, call us crazy; but we decided to give the Crab & Shrimp Dumplings a try. 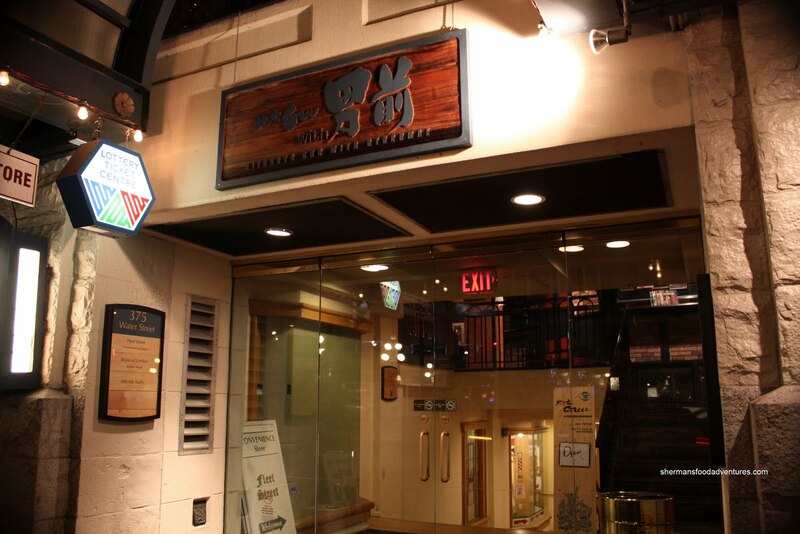 I know, this is an Izakaya, not a Dim Sum joint. 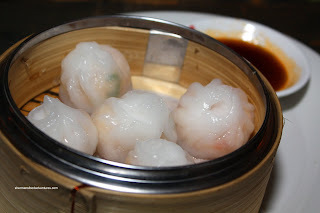 However, it just seemed so interesting to us, especially since they were steamed in a bamboo steamer exactly how it would be at Chinese Dim Sum. They weren't bad per se; but there were some issues. First, the dumpling wrapper was too thick, resulting in a gummy product. Furthermore, I didn't taste or see much crab. Sure, there was plenty of shrimp and good shrimp at that (crunchy and sweet, slightly overcooked), just not much in the way of crab. Well, crab is pretty delicate anyways and it can get lost if it is overwhelmed by other components. I think the thick dumpling wrapper aided in that respect. Another dish selected by Rich Guy was the Saba with Garlic Herb. It turned out to be a pretty large fillet of grilled mackerel with garlic chips, dill, soy and olive oil atop a bed of peppers and onion. Naturally, mackerel will never turn out to be buttery soft such as black cod; however, it was prepared nicely since it was still quite moist. I'm not a huge fan of mackerel; yet this was not bad. 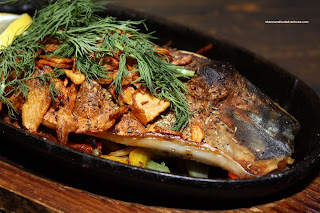 Despite the large amount of aromatics and flavouring agents on the cast iron plate, I found the fish to be surprisingly bland. 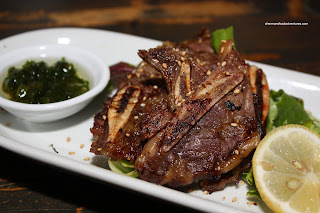 On the topic of bland, it was quite disappointing to find that the Grilled Beef Short Ribs to be lacking in flavour. Maybe because it was only seasoned with salt and pepper? On the menu, it states that it's very tasty with the green onion oil. No one at our table thought it was very tasty. Furthermore, the short ribs were cold and very chewy. We've definitely had better elsewhere. Not to worry, the meal got back on track in a hurry with the Duck Breast which is braised in red wine and soy topped with a blueberry and mango sauce. 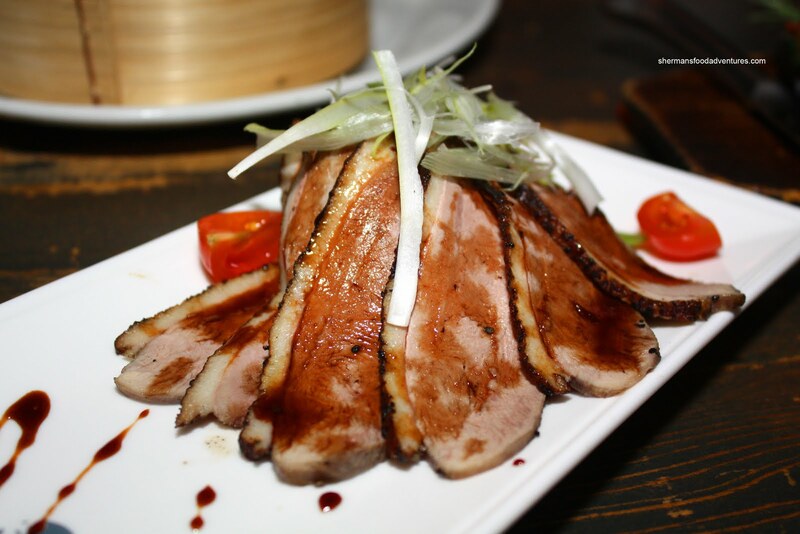 It's amazing how a place like Guu can outdo many finer establishments in terms of preparing a duck breast. As they say, we eat with our eyes and if the presentation is any indication, the dish was excellent. Perfectly cooked and uniform looking, the meat was moist and tender. The accompanying sauce was neither too sweet or too savoury - it let the duck have its day. Costanza really wanted Ebi Mayo. It's his favourite dish. He likes it so much, he wanted to order two. Our server looked at him weird and this was on top of him already wondering why we were ordering so much. We only ended up with one in the end. 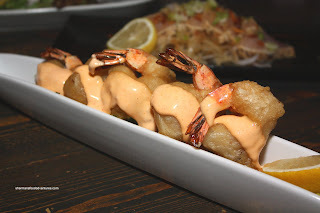 Although we liked this version of Ebi Mayo, it certainly pales in comparison to the one at Hapa. The liberal use of tempura batter added too much to the shrimp and thus partially obstructed the natural texture of the shrimp. The chili mayo had a nice kick though which is always welcomed. Another fish dish, guess who ordered it? Yes, Rich Guy. He and his rich tastes... 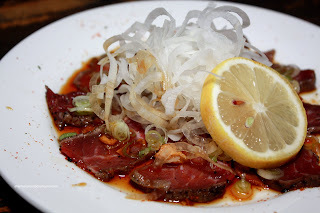 This time it was the Maguro Tataki. 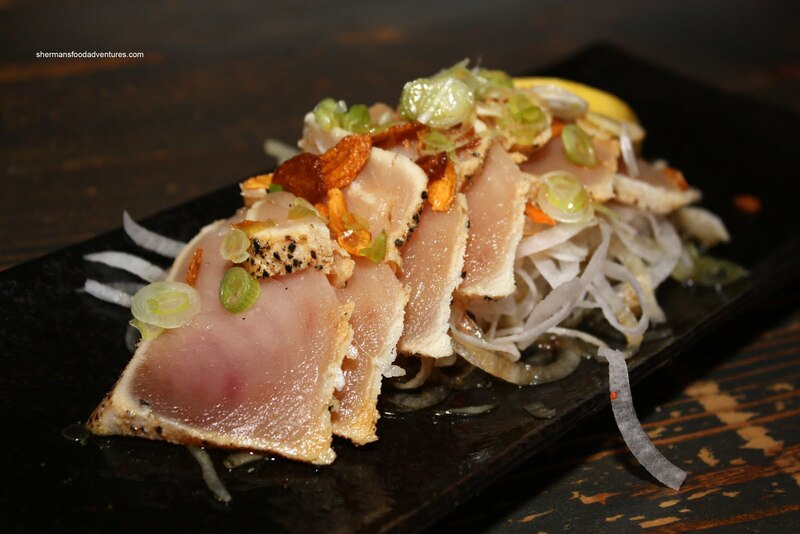 As you can see in the picture, very nice tuna, lightly seared topped with a light ponzu dressing, garlic chips and green onion. The natural sweetness of the tuna really shone in this dish and the little amount of ponzu provided a slight acidity and saltiness as an accent. Next up was the Spicy Ika Garlic. Beautifully presented as a town of fried squid, this was one of my favourites of the entire meal. 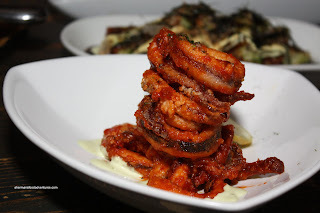 Although the squid had lost much of its crispiness due to being tossed in a spicy tomato sauce, the moisture-soaked batter made for an interesting texture. A little chewy while still easy to eat, the squid was very flavourful and spicy (not too much so). I could've had a few orders of this with a few beers. Alas, I didn't, even though I wasn't driving. That new .05 limit keeps me on my toes! When dining at an Izakaya, it is often prudent to get some "filler" dishes just to ensure satisfaction. We never did order a rice or noodle dish; but we did get the Okonomi-Yaki. It's often called a Japanese pizza or pancake. Whatever the name, it usually consists of flour, cabbage and some sort of seafood and/or meat (squid in this case). 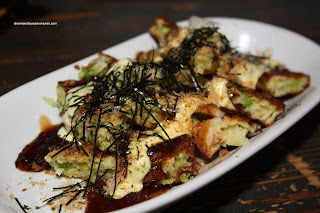 The whole thing is pan-fried and topped with wasabi mayo, tonkatsu sauce, bonito flakes and nori. The one we had here was very soft, almost falling apart when we picked it up. Personally, I like this texture more than it being stiff. The large amount of toppings and sauce made it messy to eat, but it was delicious. A good combo of sweet (predominantly), savoury, slightly spicy and tart. Alright, whenever at Guu, I get the Takoyaki or affectionately known as octopus balls. I know what you are thinking, and not it's not a bunch of ball-less octopi left as a result of this dish. Rather, it is bits of octopus combined with a flour mixture then pan-grilled in a mold. 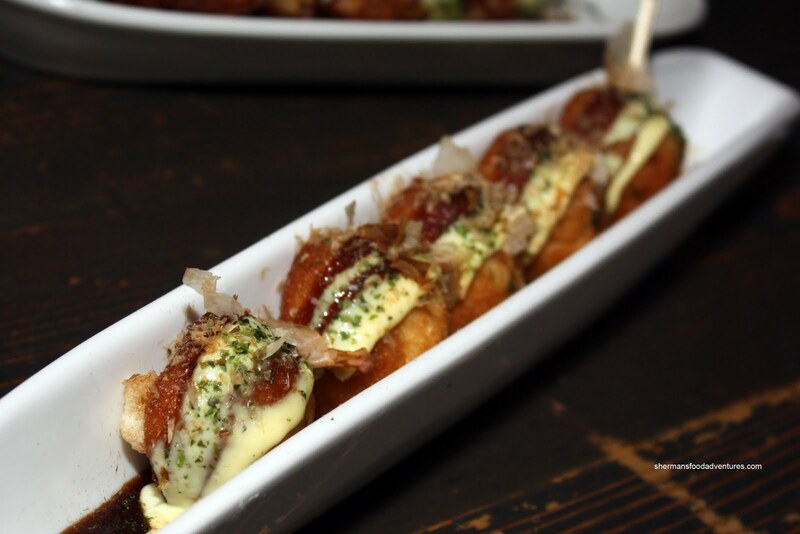 The ones here are deep-fried and topped with tonkatsu sauce, wasabi mayo, bonito flakes and dried seaweed. Good as usual. Last dish of the night was probably our least favourite - Maguro with 5 Colour Sauce. 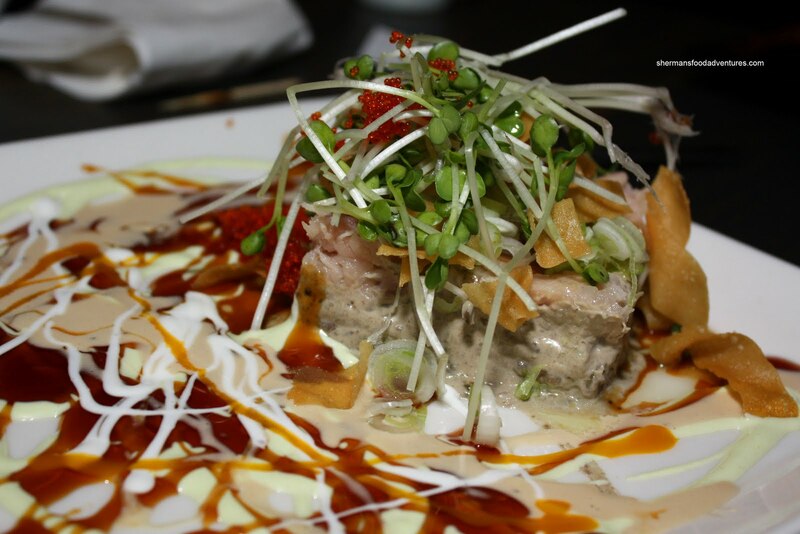 It's a combination of chopped tuna, avocado with mango sauce, wasabi mayo, sour cream, teriyaki sauce, yuzu pepper sauce topped with seaweed, radish sprouts and crispy wonton skins. Even the crispy wonton skins couldn't hide the mushiness. There was just too much going on here, too muddled and over-ambitious. However, a typical Guu experience is not like that and in fact, is very good for the price. No different this time around. Solid eats, reasonable prices, friendly loud staff along with good friends. Good times. Victoria, that sounds good! So do you think you bear a resemblance to that girl? Oh I am with Victoria on this one... that thing is pretty insane - definitely unique and delicious. Hopefully Rich Guy sprung for the tab too. Franco, I must try this dessert!